Seriously. It’s just a finger. A week ago, I got hit by a tennis ball. Turns out she wasn’t kidding. Just a few points later, a ball popped right back up at the net dragon, and whack. It hit me. Square on the tip on my pointer finger. It hurt. She yelled, “I’m so sorry!” and started to walk around the net to see if I was okay. As far as I could tell, I was, but I just needed a deep breath. Behind my sunglasses, I shed a few tears, much like you would if you stub your toe or bang your shin. Well, I don’t usually cry over stuff like that, but I do cuss. Don’t judge. It makes me feel better. A few minutes later, with slightly shaky hands, I was ready to play again. It was swollen, but not that big of a deal. At the very least, I thought it was jammed. I went home and iced it a little and planned to play in our match on Thursday. It never really seemed to get better, though it didn’t get any worse either. I checked it every day, comparing it to my other pointer finger. I’m no MD, but if things are symmetrical, I assume that everything is A-Okay. I think I learned that on Discovery Health or something. That, and if you ever hear a noise in the middle of the night, always grab a butcher knife and Delta Burke, and make sure you turn on some lights. Bad guys always appear in the darkness. Or was that Lifetime? Whatever. I tend to be laid back, dismissive even, when it comes to getting something seen about by a doctor. I made it through most of the weekend, grabbing a few cold beers with The Man at Chicken n Beer, not letting anything get in the way of our kid-free time together. By Sunday, I pretty much knew something wasn’t right, and even quit tennis halfway through the practice. The last straw was when I played in my next match, and everyone kept saying, “what is wrong with your finger?” and, “it looks really bad!” Fine. With a little help from a good friend, I got an appointment right away with an orthopedic surgeon. The first guy that saw me sincerely thought it was majorly infected. They tossed around terms like “strep” and “MRSA,” whisking in and out of the room. They seemed so secretive. Was I dying? X-rays were ordered, just to be sure. The Man wanted updates, as did several friends who were concerned. I started sending the messages, typing, “About to get X-rayed.” Did you know that auto corrects to X-rated? I didn’t realize that until I’d sent a couple. I was sent over to the hand surgeon, and the film confirmed it. Broken. He splinted it and explained that it was a mallet fracture. I hadn’t ever heard of it, but it’s apparently a common sports injury. It requires a splint for six weeks or so, keeping the finger immobile at all times. So there you have it. 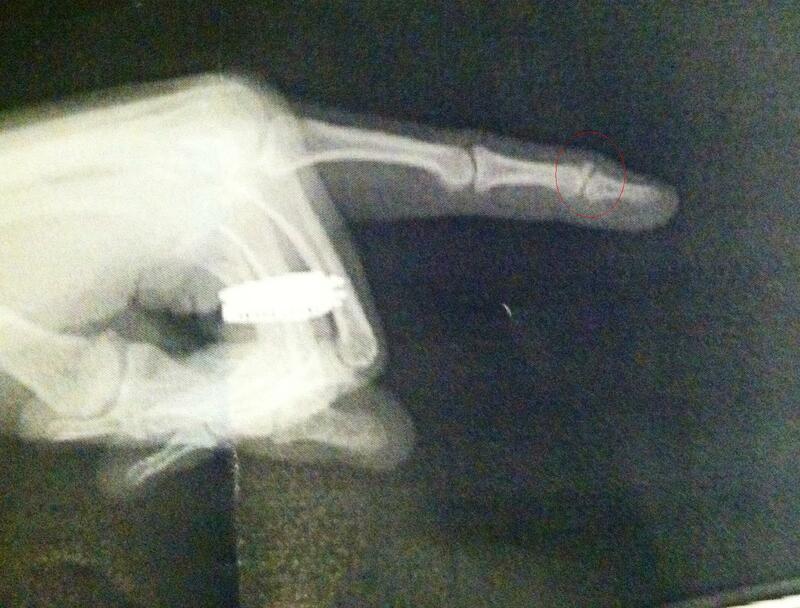 My long ,drawn out story about my silly finger. That’s exactly how I feel about it. Walking into the doctor’s office behind people who were post-op, limping, using walkers, or requiring physical therapy was downright embarrassing. I know it was worth it to avoid surgery, though. Truth be told, it hurts like a you-know-what. I can’t type all that well, and I’m out of tennis for six weeks. Obviously, I will live. It’s just annoying and a big old pain in the… finger. Ahem.